Yay for a 4 day work week! I love Memorial Day Weekend because of its signature start to the beach bumming, sun worshipping, and bbq grubbing season. I wore a casual outfit yesterday naturally inspired by the red, white, and blue and headed to a big family lunch before braving the traffic to the beach. 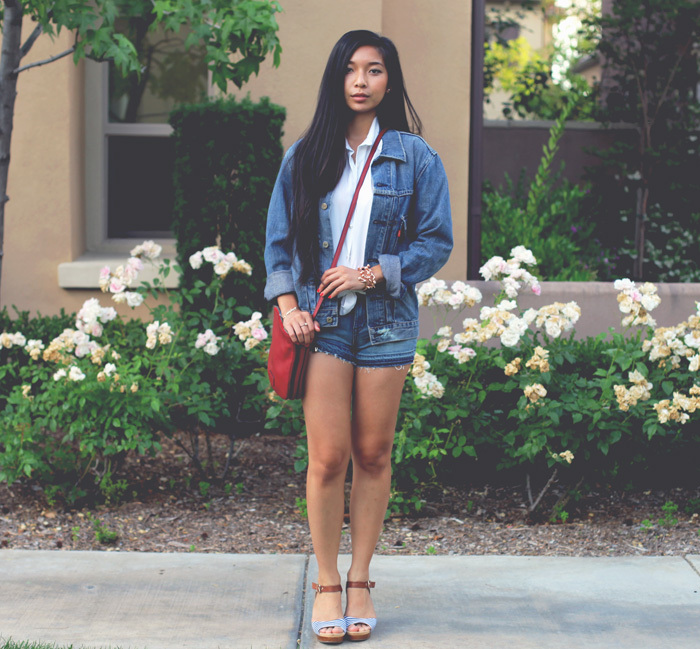 Denim to me is comfort clothes, just like comfort food. You don't have to worry about anything when you're wearing your favorite jean shorts and jacket, so you can focus on the food and fun. I also am obsessed with wearing these cute striped wedges from Dr. Scholl's Shoes almost everyday - I'm sure you can imagine how comfortable they are given their reputation in saving our feet. It is a pure marriage of function and fashion as these shoes come with cushioning insoles and a smooth lining, which makes wearing wedges possible even after an entire day of activity. This past week I also tried out this new jewelry website, ChicPeek.com, where it's a monthly membership of $30 and you can choose from any of their hundreds of cool pieces each month, including stuff from Wildfox and Gorjana & Griffin (which are well over the $30 price point!). I love this rose gold coral cuff I picked out from Wildfox (originally worth $140) because of its unique shape and feminine pearl details and it goes with any summer-y outfit with its allusion to the deep sea. If you want to try out ChicPeek.com for free, I'm giving away a one-month membership for one free piece of jewelry! A winner will be chosen at random on June 12th. Good luck and thanks for entering! P.S. today is the last day to get 40% off all dresses at LAST NIGHT! SImple, easy, classic. Love this. My favorite item from ChicPeek is the FreeBird Ring by Sigal. Cool look. Love the shoes. So patriotic!!! Love the color scheme! Denim is always a good choice! I follow on GFC - my favorite piece is....Cow Skull Fringe Necklace by Wildfox! - I love the Chevron Bangle by Gorjana & Griffin! Thanks for the awesome giveaway dear! Hi Stephanie! Thank you again for featuring us in your posts and writing such great things about us! We appreciate your feedback. Hope you've been well!